MIT physicists studied how a cloud of ultracold lithium atoms transitions from a typical gas to a superfluid — a state where particles flow without any friction. MIT physicists are studying phase transition to gain a better understanding of superconductivity of electrons in metals. By examining how a gas turns into a superfluid, a state where particles flow without any friction, they hope to gain a better understanding of the equation of state for incredibly dense neutron stars. Every time you boil water in a kettle, you witness a phenomenon known as a phase transition — water transforms from a liquid to a gas, as you can see from the bubbling water and hissing steam. MIT physicists have now observed a much more elusive phase transition: that from a gas into a superfluid, a state where particles flow without any friction. The MIT work, published last week in the online edition of Science, also sheds light on the superconductivity of electrons in metals, including high-temperature superconductors that have the potential to revolutionize energy efficiency. The researchers, led by MIT assistant professor of physics Martin Zwierlein, carried out their experiment with an isotope of lithium that has an odd number of electrons, protons and neutrons. Such particles are called fermions. In order to become superfluid and flow without friction, fermions need to team up in pairs. This is what happens in superconductors, where electrons form so-called Cooper pairs, which can flow without any resistance. Analogous to the transition from water to steam, the transition from the superfluid (pairs) to the normal gas (single unpaired atoms) should be accompanied by a dramatic change in the gas’s pressure, density and energy. To directly observe such a transition in a gas, the MIT team had to first trap the lithium gas in an atom trap (in which atoms are held in place by electromagnetic fields) and cool it to ultralow temperatures — less than a hundred billionths of a degree above absolute zero. At this point, a superfluid comprising atom pairs was expected to form in the center of the atom trap, surrounded by a normal region of unpaired atoms. A light was then used to cast this atom cloud’s shadow on a camera. Using the shadow images, Zwierlein and MIT graduate students Mark Ku, Ariel Sommer and Lawrence Cheuk set out to precisely measure the relationship between the pressure, density and temperature of the gas. The relation between these three variables is known as an “equation of state” for the system. (For example, for the steam in the kettle, it is known that as the temperature increases, the pressure will also increase.) An equation of state completely determines the thermodynamic properties of a system, including its phase transitions. An obstacle in previous experiments on the thermodynamics of ultracold gases was the absence of a reliable thermometer that can measure the temperature of a puff of gas more than 10 million times colder than interstellar space. The researchers solved this problem by carefully characterizing the properties of their atom trap. 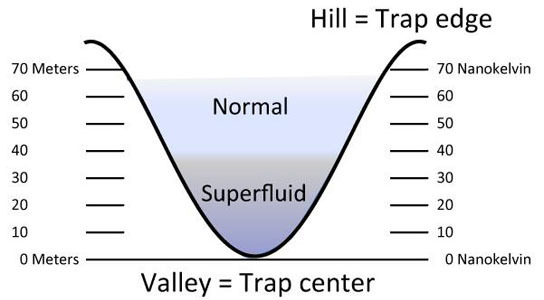 Think of the trap as a valley filled with fog: In the upper regions, one would encounter less dense regions of fog, while down in the valley the fog gets denser. By measuring three quantities — the gas density at a given height line, its change from one line to the next and the total amount of gas encountered on the way down to that height — the researchers could determine the equation of state of their gas of fermions. The atoms in these gases interact very strongly, not unlike the electrons in high-temperature superconductors. The exact mechanism for superconductivity is not yet understood, and so far, physicists have not been able to predict materials that would become superconducting at room temperature. The MIT team has now measured the critical temperature for superfluidity in their atomic Fermi gas and shown that scaled to the density of electrons in a metal, superfluidity would occur far above room temperature. The new work represents an “outstanding achievement,” says Wilhelm Zwerger, a professor of physics at Germany’s Technical University of Munich who was not involved in the research. According to Zwerger, determining the phase transition for superfluids not only sheds light on Fermi gases and high-temperature superconductors, but could also help scientists better understand the equation of state for incredibly dense neutron stars, which are heavier than the sun but have a diameter of only about 12 kilometers. Be the first to comment on "MIT Physicists Study Superfluid to Better Understand Neutron Stars"